A picture of the monument,taken around 1910. A stone monument stands near the town of Pavia in Bedford County, Pennsylvania. Erected by public subscription, it commemorates an event that is still unexplained today. On the morning of April 24, 1856, the two young sons of Samuel and Susannah Cox vanished. The boys, George (seven) and Joseph (five), had wandered off into the woods near the family shack, and they didn’t respond to their parents’ repeated calls. Samuel made his way to the house of his nearest neighbors to enlist their aid. One of them set out on horseback to enlist more help from all the farmers scattered for miles around. By nightfall, more than a hundred people were searching the woods for the boys… but they had no luck. It had been a warm night, so there were good odds that the boys were still alive; at daybreak the search began again, with more volunteers who had traveled several miles to assist. But, once again, the searchers came up empty-handed… and they did so for the next ten days as well, even though the number of searchers swelled to over a thousand. The parents became so desperate that they asked a local dowser and a local woman with the reputation of being a witch to help; neither could. Soon, suspicions turned on Samuel and Susannah Cox themselves as several people accused them of doing away with their own children. The floor of the family’s shack was torn up and the yard around the home was dug up, in an attempt to prove the theory, but nothing was found. It was at this time that a farmer named Jacob Dibert, who lived about 12 miles distant from the Cox’s, had an odd dream. In it, he was searching alone for the children in a section of the woods that he had never seen before. As he walked forward he discovered a dead deer just past it. He stepped over the body and followed a deer trail until he found a child’s shoe; beyond that was a fallen beech tree which allowed him to cross a stream. Next he came to a stony ridge that led into a ravine with a small brook; and there, in the shelter of a semi-circle formed by the roots of a birch tree, he found the boys… dead. Dibert told his wife about the dream, and they decided to keep it to themselves; but when the dream repeated itself on the following two nights, they decided to tell Mrs. Dibert’s brother, Harrison Whysong, about it. Whysong was familiar with the area the boys had disappeared in, and there were similarites between this area and Jacob’s dream. So the two men went to the area and began to search; five minutes later, they found a dead deer… exactly as in the dream. Then the child’s shoe… the beech tree over a creek… the stony ridge… and the birch tree. At the roots of the birch tree they found the boys, George and Joseph Cox, dead of exposure. The boys were buried in Mt. Union Cemetery on May 8, 1856. 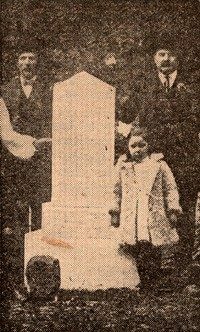 In 1906, on the fiftieth anniversary of the tragedy, the stone monument was erected near the site the bodies were found so that the strange event would never be forgotten. Frank Edwards, in Stranger Than Science, states that Dibert told Wysong about the dream after the second time it occurred, while Rhoda Bender in an 1955 article and Fay Wentworth in an 1997 article, both in FATE Magazine, state that this happened only after the third time the dream recurred. Both Edwards and Wentworth add that Dibert stepped up onto a fallen tree before seeing the dead deer; Bender, in the earliest article, does not include this detail. All three authors spell Harrison Whysong’s last name as “Wysong”. Wentworth also adds that years later in June 1891, after Jacob Dibert’s death, his son Isaac also had a dream which showed him the location of a lost girl; the location in his dream proved to be correct, and the girl was rescued. Of course, this doesn’t answer the big question… did the event that the stone memorializes happen, and did it happen as described above? The earliest source of the story I have is Bender’s 1955 FATE Magazine article. In this article, she cites as her source for the story the three-volume History of Bedford and Somerset Counties, by E. Howard Blackburn and William H. Welfley. I will try to track down a copy of this set of books, as well as try to find some contemporary newspaper articles from the time of the occurrence. Please be patient, eh? Thanks go out to Steve Fogel and Herman Nagle for providing me with pictures of the inscriptions on the monument. “The Dibert Family Messages”, by Fay Wentworth, in FATE Magazine, November 1997, pg. 80. “The Lost Children of the Alleghenies”, by Rhoda Bender, in FATE Magazine, September 1955, pg. 10-13. Stranger Than Science, by Frank Edwards, 1959 Lyle Stuart, Inc, pg. 25-27.